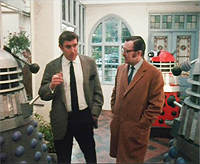 When Terry Nation’s Dalek spin-off The Destroyers wasn’t taken up by the BBC, he took the concept to America, prompting the BBC to write the Daleks out of Doctor Who for good. The supposed “final end” of the Daleks had been recorded for The Evil of the Daleks in June 1967 when the story had already begun broadcast. Transmission concluded on 1st July and the props were placed into storage with Dalek Five-6 being retained by Shawcraft. 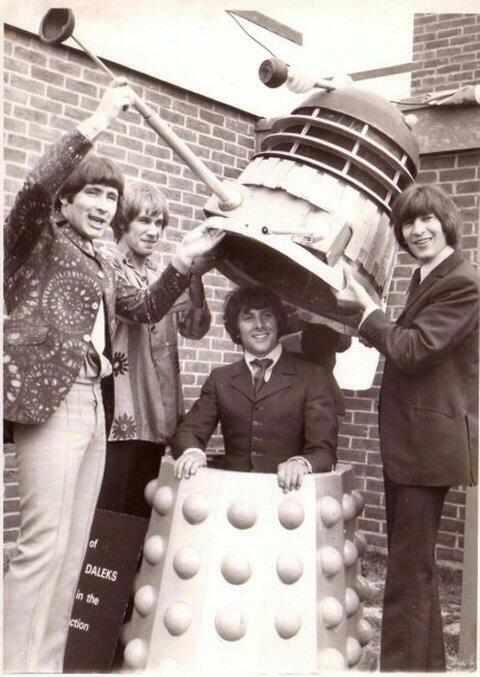 The Troggs with Dalek Six-5 in Andover. Click for a larger view. However, it wasn’t long before the props were called on again to make public appearances and one of the first was at Andover Boys’ Secondary Modern where there was a fund raising day for their new swimming pool. Despite the apparent diminishing interest in the Daleks by the general public, they were still deemed a big enough draw at events such as this. In this case, it was arranged that a new combination of Dalek Six-1 (the top half of which was complete with its black dome from Evil of the Daleks) should attend. Also at the event were pop group The Troggs, who were increasing in popularity at the time having had several hits by 1967 including a UK number 2 with Wild Thing. They were formed in Andover in 1964 so had a strong connection to the area. 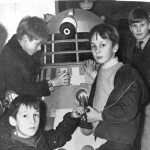 The chance of picturing the group with a Dalek was one the local papers took with glee! 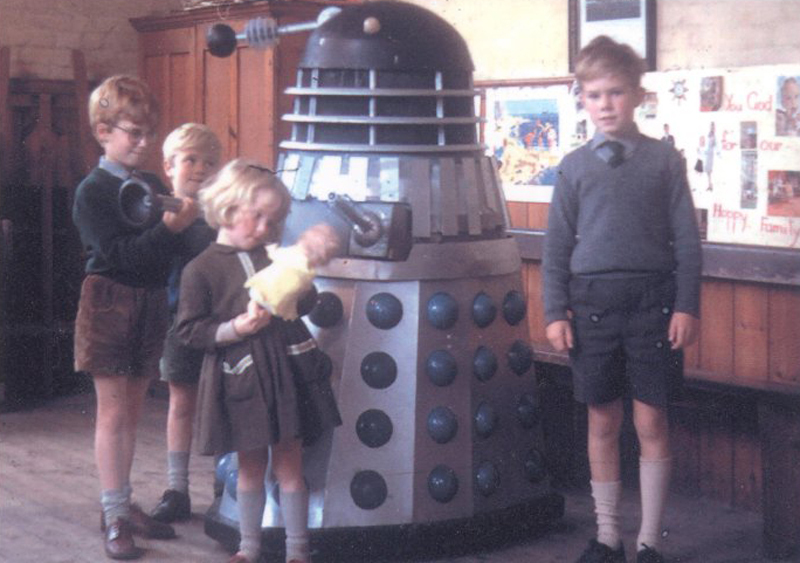 Dalek Six-5 with David Speight and his brothers and sister. Picture – David Speight. Click for a larger view. “A friend of my father’s brought his reel-to-reel tape recorder and recorded a good imitation of a Dalek’s voice. Before the rummage sale began, we all got to meet the Dalek. I remember telling my sister that this can’t be a real Dalek because we would have been exterminated by now! I wish there were photos of the people who turned up for the church rummage sale that day. As they walked in, the Dalek herded them to the tables where things were being sold. All it said was: ‘You will obey… You will spend ALL your money, or you will be exterminated!’ Some kids cried, some adults looked disbelievingly at it, but the elderly folk, there for the bargains, seemed not to care much. I remember one old woman pushing the Dalek away so she could get to the sale table! Yes, I got to sit in it, and was surprised at how DIY the inside was! A wooden plank to sit on, and a push button to light up the ‘eye’. I wasn’t strong enough to move it while inside, but I don’t care because I met a Dalek! 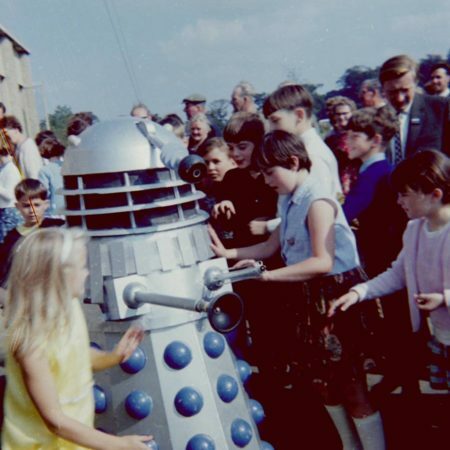 Dalek Six-5 at the Wenvoe Open Day in 1967. Click for a larger view. Dalek Six-5 was in demand and soon afterwards the prop was required again. In September, the BBC were launching a colour television service from their Wenvoe transmitter in the Vale of Glamorgan, South Wales. Dalek One-7 at the Tacolneston transmitter. Click for a larger view. An Open Day was arranged at the site and crowds flocked to see the various exhibits and demonstrations the BBC had set-up. The attractions included a colour tv theatre and Dalek Six-5 was useful in clearing the congestion that had built up there! 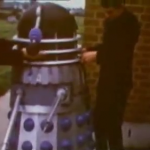 BBC Engineer Alan Davies was on hand to show how the Dalek was operated. A short 8mm film of the event can be seen here. Wenvoe wasn’t the only transmitter site to have an open day that month – the Tacolneston transmitter near Norwich was also being upgraded to transmit colour and a similar event was held on the site. A report suggests that two Dalek props attended and a photo shows confirms that a prop made up from Dalek One’s shoulders and the skirt of Dalek Seven (Dalek One-7) was attracting a great deal of attention. Three months after the ‘Evil’ recording had taken place, two Daleks paid a visit to the offices of BBC Cardiff in October 1967. 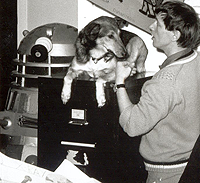 The first prop which came to terrorise the staff was made up of the shoulders of Dalek Two, with the distinctive collar lift still present, fitted with the neck of Dalek Seven (as it had been for a year since recording of Power of the Daleks) and a dome still painted black from its recent tv appearance. The skirt for this prop was the original skirt from Dalek One. The second prop had the shoulders of Dalek Seven (with its flat-top movie-mould gunboxes) with the neck of Dalek Two, still sporting the distinctive neck repair (also as it had been in Power). It had the skirt of Dalek Two. The following month, on November 13th 1967, three props were in attendance at the Blue Peter Studios at Lime Grove. Contrary to appearances, this did not form part of an episode but was merely a photo-call for the forthcoming Design-a-Monster competition. The two props which had visited Wales had had their tops swapped over which meant that Dalek Two was now reunited into a complete prop once more, whereas the other halves formed Dalek Seven-1. 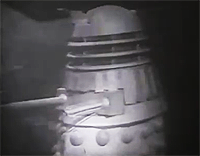 The third prop was Dalek Five-6, the prop normally retained by Shawcraft at their workshops. The shoulders of Dalek Two had been painted silver in the month since the Cardiff visit. The publicity stunt took place on November 17th as part of a students’ fund-raising mission for Cancer Relief, and the Dalek was given a collection tin to carry. 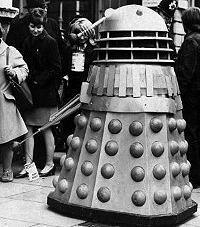 The prop featured the shoulders of the original Dalek One which paired with the movie-style skirt of Dalek Seven. The shoulders were in a state of some disrepair, with join at the rear of the lower collar having come loose, leaving the ends trailing, and several slats were broken or lost. This was possibly due to the mauling it received at the Tacolneston Open Day in the September. The availability of props for use in non-BBC work would become increasingly frequent, and the fact that the props weren’t being scheduled for further use on Doctor Who meant that any damage sustained was not repaired. On the 8th December one of the Daleks made a return to the Blue Peter studios where it had had a photo-call a month earlier. 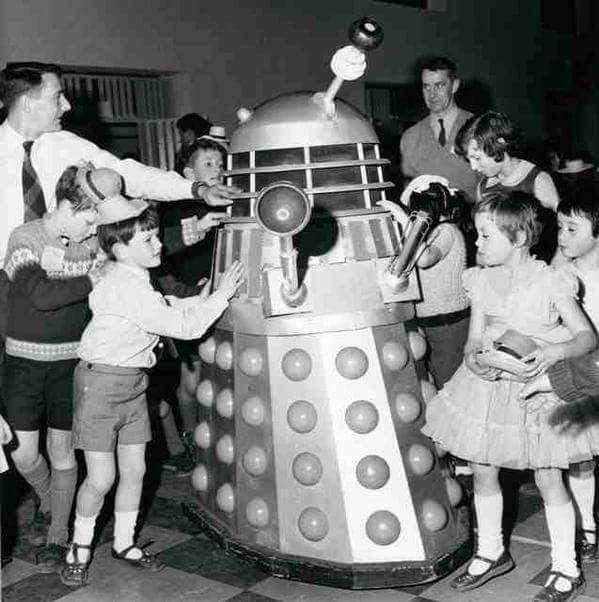 Dalek Six-5 at the National Physical Laboratory kids Christmas party in 1967. Click for a larger view. Once again, this was for the Design-a-Monster competition, and Patrick Troughton was in attendance alongside the programme’s presenters in order to chose a winning entry for this competition. The prop was very dusty from its spell in storage, but it was otherwise in fine condition. 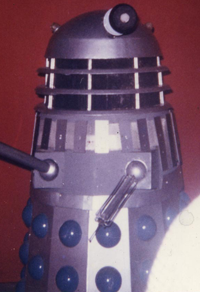 This top half of Dalek Two was still sporting its small pupil and lower collar lift. The same month also saw Dalek Six-5 out and about again. This time it was visiting the National Physical Laboratory in Teddington where they were having their Christmas party for children. 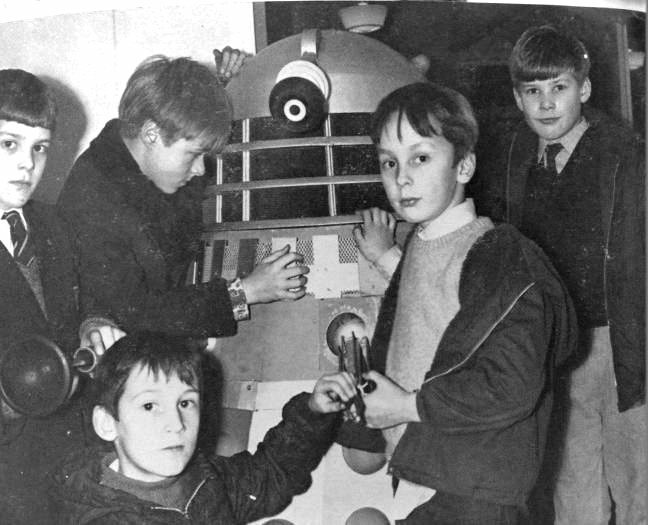 A couple of weeks later, and tying into the Blue Peter competition, the Daleks made another appearance at the Daily Mail’s “Boys and Girls Exhibition”. In their last appearance in Olympia during the height of Dalekmania, Doctor Who was represented by just two Dalek props in their Dalek Invasion of Earth guise. This time around the Daleks were joined by original Cybermen costumes, as well as Yeti and other monsters, plus three winning monsters of the Design-a-Monster Competition, built by BBC Visual Effects. 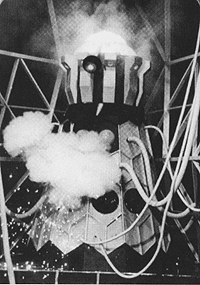 The exhibition ran into January 1968 and featured one of the Daleks just as it had appeared in the Blue Peter studios a month-and-a-half previously. A distinctive scratch on the front panel of the skirt helps identify the lower half, and the shoulders are the movie-mould set first used in The Chase, which demonstrates the prop is still a pairing of Dalek Seven and the skirt of Dalek One. Interestingly however, unlike the Blue Peter appearance, the eye-ball has no iris. Having run for nine years, the highly-successful BBC documentary Whicker’s World was famed for reporting stories of social interest from around the globe. Its presenter was journalist Alan Whicker who chose a diverse range of topics and interviewees, so it was perhaps not surprising that he should speak to the man who had created a fictional icon – Terry Nation. In the programme of 27th January 1968 – A Handful of Horrors: I Don’t Like My Monsters to Have Oedipus Complexes, Nation was shown in his home which revealed that he lived with four Daleks from the second feature film released eighteen months previously. One of the props was red and black – but the colour is misleading and its its identifying features revealed its true origin. A prominent bolt between the slats over the gunbox and another at the rear, one slat missing and one bent but, most notably, it had uniquely wide-spaced rivets affixing all the slats – which reveals this to be the Gold Dalek from Daleks: Invasion Earth 2150AD –Dalek AARUII 12. Also in his possession were Daleks AARUII 9, 11 and 14-5. More about these Daleks can be read on our Nation’s Daleks Page. A television programme which had already notched up eleven years by this point was the monthly astronomy programme, The Sky at Night. For the programme broadcast on 28th April 1968 two Dalek props made an appearance along side the show’s presenter, Patrick Moore. And so on the 1st June 1968 the final episode of Patrick Troughton’s second season was broadcast. It was the fifth year that Doctor Who had been on air, but it was the first time there had been a year of production without the use of Terry Nation’s creations. Series four had in fact been the first time that two Dalek stories were present in one season, with Patrick Troughton’s early tenure bookended by his battles with them. But in Troughton’s second year it was the Cybermen who were promoted to lead villain, and season five had opened with Tomb of the Cybermen and closed with The Wheel in Space. But then a strange thing happened. In the closing moments of this summer Cybermen adventure, potential new companion Zoe had stowed away in the TARDIS and, in an attempt to alert her to the dangers of their travels, the Doctor asks her if she’s heard of the Daleks. She says that she hasn’t and so the Doctor uses a head-set to weave his recollections into a complete story for her. 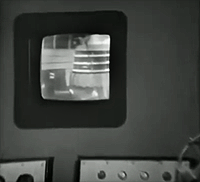 What then appears on the screen is a clip from the last few moments of episode one of Evil of the Daleks. The following week, a repeat then began of the previous year’s ultimate Dalek serial, and a specially-recorded voice over then brought the action back to the start, with Zoe asking, “What about those Daleks you showed me?” and the Doctor sensibly replied, “Just let me show you the story from the beginning.” Not only was this the first time ever that a Doctor Who story had been repeated, but this diegesis meant that in a very strict sense a Dalek story does become part of the show’s fifth year after all. The country was treated once again to the apocalyptic “final end” of the Daleks on Skaro on 3rd August 1968 but in a painfully ironic twist, this epic adventure was then immediately selected for deletion. Since the BBC had no videotape library at the time, the tapes themselves remained property of the BBC Engineering Department for which there was no mandate, and if the production team gave any indication that a particular recording was surplus to requirements then the tapes could be wiped and recycled. Film tele-recordings had been made with a view to selling Doctor Who overseas, and these survived for some time after, but August 1968 saw the annihilation of episodes one to six in their original form. Episode seven would be retained for 13 more months before that too was expunged. 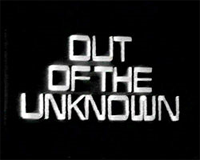 The BBC had developed an anthology show called Out of the Unknown for broadcast on BBC2. It had begun in 1965 and, just like Doctor Who, it had been created by a woman under the supervision of Sydney Newman. Irene Shubik had approached Newman with the desire to create a science-fiction version of Armchair Theatre and television writers were drafted in to adapt works by known science fiction authors and newcomers alike. One such writer was Terry Nation, who adapted Ray Bradbury’s The Fox and the Forest for season one of the show. 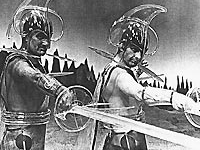 It was during season three in 1968 however that an adaptation of Peter Phillips’ Get Off My Cloud required the cooperation of Nation once again – but this time, it was over a plan to feature his Daleks in the episode. Keen to somehow include an element of successful BBC1 show Doctor Who, the BBC had a back-up plan if Nation refused to agree – they would use the Cybermen instead. The back-up plan was not needed however, as Nation consented to their use, and so plans were made for the Daleks to be brought in for their first proper TV work for over a year. On 8th August 1968 three of the six available Dalek props arrived at Ealing studios. 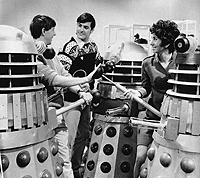 Three experienced Dalek operators were drafted in: Kevin Manser, Robert Jewell and Murphy Grumbar. The first sequence for which the Daleks were needed was set in a remote farmhouse. This opening scene concerned one of the protagonists – a sports journalist called Pete Parnell – having flashbacks to his youth. As a young boy, he had nightmares about certain monsters from the television show Doctor Who. The first Dalek scene required them to burst into his bedroom and menace him. In the script, Pete then tells his father of his terrors, and his father has the idea of trying to implant the image of a Colt .45 revolver into his dreams so that he can defend himself. The father shows Pete a picture of the weapon. When Pete next falls asleep, another nightmare ensues and one-by-one the three Daleks enter his room again. But just as his father hoped, the picture of the gun appears within the dream and the boy is able to lift it from its frame and he fires five times at the alien intruders, who beat a hasty retreat. All the action was captured on 35mm film. This flashback was something of a red-herring at the start of the episode, which opened with the grown-up Parnell relating that boyhood experience to a psychiatrist. 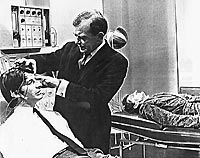 The concept of the episode was that Parnell could provide an average mind which is linked via a piece of technology to a mentally-ill science fiction writer called Marsham Craswell. The hope being that Parnell’s lack of imagination will balance the bizarre fantasies troubling Craswell. Exactly two weeks later on 22nd August, Peter Hawkins was employed to add the grating voices, making this is a very typical outing for the Daleks in all respects except it wasn’t Doctor Who. Hawkins recorded the lines of “exterminate, annihilate, destroy” for when the Daleks burst into the bedroom, harking back to the chanting from Power of the Daleks, and he provided appropriate Dalek screams when the boy shoots at them. By coincidence, the month after this episode of Out of the Unknown was recorded, the Doctor Who story entitled The Mind Robber began broadcast. The two stories were littered with similarities. The Mind Robber‘s first episode also featured a young man terrorised by a nightmare, and again the nightmare later became a reality (in this case Jamie and a unicorn). The story as a whole dealt with the same theme of a world of fiction which could be altered by those inside it and perhaps most significantly, it also included a scene in which two men were linked via a machine which allowed them to exert their willpower in a creative battle. 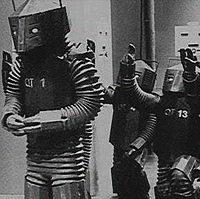 As if the similarities in plot weren’t enough to raise an eyebrow, when the production team needed several robot props to appear in the hastily-written first episode of The Mind Robber, it was decided that they would recycle a set of costumes created for a 1966 episode of Out of the Unknown called The Prophet. It is a strange twist indeed that the Daleks should appear in one fictional tale from Out of the Unknown which depicted the nightmares caused by Doctor Who, whilst Doctor Who itself no longer featured the Daleks, but instead created the new threat of a Land of Fiction populated by robots borrowed from Out of the Unknown. The episode Get Off My Cloud was broadcast the following year, on 1st April 1969. 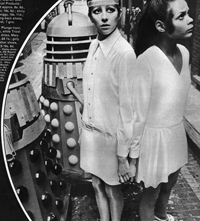 Fourteen months after appearing on Whicker’s World, Terry Nation’s Daleks were in use for a photo-shoot for the magazine Honey in which the props were used to accompany two fashion models wearing what were suppose dly future-inspired styles of clothing. “Out-a-space white is out-a-sight” it proclaims, as the women pose with the props. The casings themselves appear almost exactly as they had done the previous year when Alan Whicker came to visit the writer. One prop was painted red with black hemispheres (having been gold in the film) and the other was silver with blue hemispheres. They are both in extremely good condition, even four years since their big screen work. 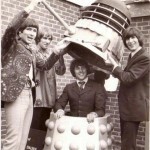 For a detailed explanation of the four Daleks which lived with their creator, you can visit the Terry Nation Props page. In June 1969 Patrick Troughton’s final story was being recorded. At the climax of this story, the Doctor was put on trial and as part of his defence he listed all the evils in the universe he had fought. Not surprisingly, one of the foes he wished to depict was a Dalek. 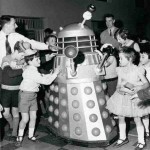 Episode ten featuring the trial was recorded on June 12th and a Dalek prop was duly assembled. It had been ten months since the Daleks had last been needed in a television studio for Out of the Unknown (broadcast two months earlier) and despite five other normal Dalek skirts being available, the skirt which was chosen for use was the thin skirt from Dalek Eight. To make matters worse, rather than its original matching thin shoulder section, the top which was used was that of Dalek Seven (originally the “stunt Dalek” built for The Chase from movie moulds). These shoulders were paired with neck of Dalek Two, with its notorious neck repair. Overall, the prop was in poor condition, with a missing light, broken eye-discs and plenty of wear-and-tear in evidence. The end result was a dishevelled, mismatched prop whose shoulders over-hung its skirt. It was not an impressive showing for the now rarely-seen Daleks, but it remained a thankfully low-key appearance on a screen projected behind the Doctor. This was the last-ever appearance of a Dalek on Doctor Who in both the 1960s and in black and white. 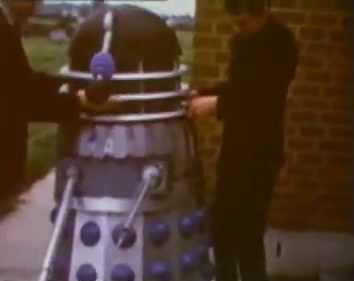 A year after the Dalek cameo in The War Games, May 1970 saw a Dalek pop up in a BBC Pilot entitled “What’s the sense”. By this stage the Daleks’ appearances were becoming few and far between. 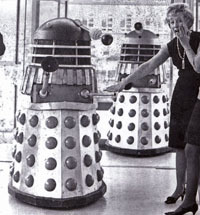 The two Daleks given to the Dr. Barnardo’s charity by the BBC had seen a busy life since 1964. Dalek Three and Dalek Four travelled the country generally visiting towns where a Barnardo’s home was situated. This active life coupled with the many hands of small children meant the props deteriorated quickly and in their last verifiable appearances in 1965 (Dalek Three, Dalek Four) the Daleks looked in a very sad state. Dalek Five-6 on one of its many charity outings. Click for a larger view. Dalek Five-6 had been retained by Shawcraft Models after work on Evil of the Daleks was completed in 1967 and was quickly put to use in charity events. By 1970 the prop had visited many schools and hospitals including the Holy Trinity and St. John’s Church of England schools and King’s College Hospital in south London. The prop remained in its basic silver and blue finish but had been given larger castors to help it move over the rougher external terrain. The Daleks’ last full story on the programme was becoming a fading memory and the new production team lead by Barry Letts wanted to exclude old foes in favour of newly-devised creations. As the television industry was expanding, the storage of unnecessary props and scenery became an increasing luxury. It was perhaps inevitable that if the BBC had a purge of old, damaged or unwanted items to make more storage space4 then the issue of the Daleks’ retirement would come up. Having not been afforded their own television adventure for years, the dilapidated old props must have seemed increasingly irrelevant. As part of this rationalisation the skirt of the thin Dalek Eight, along with the shoulders of the original Dalek Two ended up in a skip. However, these two halves were rescued by BBC Visual Effects Designer Bernard Wilkie who recognised the components for what they were and put them to good use as a play thing for his children. Only two Dalek sections were never seen again after the 60s, these being the thin shoulders of Dalek Eight and the skirt of Dalek One. The skirt of Dalek Six and the shoulders of Dalek Five remained paired up at Shawcraft, whilst the remaining components went into storage. Surviving into the 70s therefore were: the inverse halves of the Shawcraft-kept prop i.e. Dalek Six-5, the complete Dalek Seven, the skirt of Dalek Two and the shoulders of Dalek One, all remaining in their silver/blue livery. Thank you to David Speight.